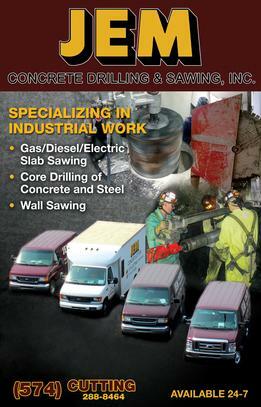 JEM Concrete Drilling & Sawing, Inc. is a family owned business that began in 2005. A focus on safety and customer satisfaction has allowed us to continue to grow to where we are today. JEM uses the highest quality equipment available to ensure that your project gets completed safely, efficiently, and to your specification. As part of our attention to safety, all JEM employees have completed OSHA 10-hour safety courses. While most of our work focuses on Indiana, Michigan, Illinois, and Ohio, we also travel all over North America. Ed Anthony, president and owner, started the company in 2005. Ed brings over 30 years of concrete cutting and drilling experience to JEM. He has made his values of safety and customer satisfaction the cornerstones of JEM Concrete Drilling & Sawing, Inc.